Happy Thanksgiving! Small Business Saturday! and reopen on Friday, Nov 25. You’ll get 20% off one item or one cut of fabric. For every $10 you spend, you’ll get a raffle ticket for one of three prize baskets. Plus, we have pulled a lot of books and patterns and put them on sale for 50% off! There’s a wonderful selection, and you can easily find some Christmas gifts or add to your own library. We hope to see you on Saturday! 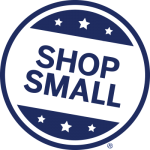 And remember, there are lots of other small businesses in Fair Oaks Village, including restaurants, gift shops, and antique shops. So plan to spend a few hours in the Village, have some lunch, put a dent in that holiday shopping, and celebrate America's small businesses. In hopes that our customers soon will be there. This year’s stockings are very cute (as always). You’ll have a hard time picking the top three. and winners will be announced on Thu, Dec 8.
couple of extra days before we deliver the stockings to CASA. Remember, you can still turn in your stocking until Dec 8. You won’t have as many days for your stocking to receive votes, but you’ll make a child’s Christmas brighter. Thistle Dew is a drop-off location for Toys for Tots. Please bring new, unwrapped toys to the shop before December 15, and help make Christmas joyful for all the children in Sacramento. Big Lacie Bag, The Big Lacie Bag is the perfect size to do many jobs - from carrying your sewing tools to carrying your essentials for traveling. It's 9" long x 5" wide x 8" tall, and inside are two spacious pockets adorned with rouched elastic to hold items upright. The bag is topped with a very cute 12" Lacie Zipper which is sooooo easy to attach! Makes lovely gifts for family and friends or for yourself. Bet you can't make just one! 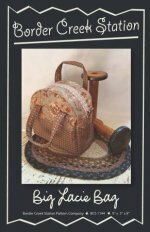 Annemieke York, $25, Fri, Dec 2, 10:00 a.m. - 4:00 p.m. Supply list, including purchase of pattern. Sue Spargo Felted Wool Needle Case. Have you seen all of our beautiful felted wool sample projects and wanted to learn the techniques used to make these pieces? This is the class for you! In these two sessions, you'll learn how to applique wool pieces to a wool background and then Judy will teach several beautiful, simple embellishment techniques. And, you'll have a unique, usable needle case! Judy Cummings, Mon, Dec 5 & 19, 9am - noon, $40 for two sessions, supply list, including pattern. Pointed Tile Variations (Cindy Blackberg). A beautiful Lucy Boston pattern by Cindy Blackberg that uses her stamp sets. Use traditional fabrics, contemporary fabrics, solids, or another choice to make this uniquely yours. It measures 28" x 28", but you can add more blocks for a bigger quilt. Judy Cummings, 3rd Mon, Jan-Apr 2017, $80 for four sessions. Quilters' University 2017- Beginning - DAY. 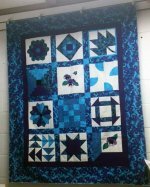 Kari has created her own wonderful design and used it for several years of beginning quilting classes. While making this quilt, you'll learn techniques beyond the usual beginning piecing, including curved piecing and applique (machine and hand). Of course, Kari will also cover all the other basics, too. Kari MacDonald, 1st Wed -OR- 1st Thu of the month, 10:30 a.m. - 12:30 p.m., $20/class, supply list. Students must sign up for three months at a time. The signup fee for the first classes will be $75: $15 registration fee and $60 for the first three classes. After that it will be $60 for three classes. Quilters' University 2017- Beginning - EVENING. These sessions are for very beginning quilters -- those who have never quilted before. 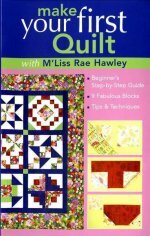 You will use the book Make Your First Quilt by M'Liss Rae Hawley to learn the basics of quilting and make a beautiful sampler quilt. Dana has taught this class for several years, so she has a wealth of knowledge and lots of patience. $20/class (Students must pay for 3 classes at a time - $60.) 1st Tues of each month, 5:30 - 8:30 p.m. Dana Lahargoue. The first class will be January 3, 2017. 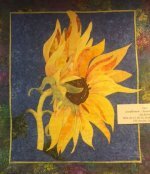 Sunflower Wallhanging (fusible applique). This beautiful sunflower will be a gorgeous addition to any home. It's an original Sue Rohrke design and is made using fusible applique. The technique is easy to learn, and selecting and arranging your fabrics into your own unique sunflower will be so much fun. Sue Rohrke, Wed, Jan 11, 18, and 25, 2017, $70, supply list. We've received lots of new Renaissance Ribbons, including designs by Sue Spargo and Kaffe Fassett. And remember, our remaining stock of Frivols is 50% off!!! !